← Get Ready, They’re Coming! Once again, the Starbucks Holiday ornament release is extreme. Rose gold, a design element trending worldwide, is seen in many of them. 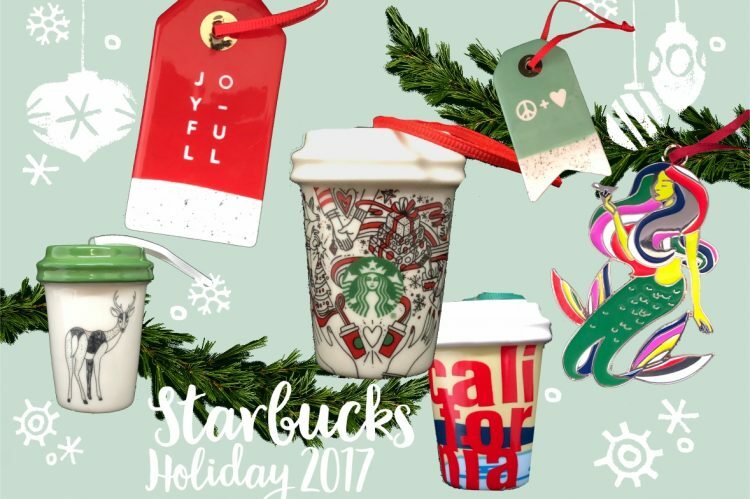 This year’s Red Cup is not actually red as Starbucks chose an illustrated design. Here is a full list of holiday collections. I casually bought some ornaments for my better half four years ago… and it has turned into me locating and buying *every* ornament *every* year. With your catalogue, I will be busy and broke for many years to come. I haven’t seen the 4 ornements from Seattle Roastery you said above… Can you post the pictures? Thanks for visiting! The images of the new roastery ornaments are now in the catalog gallery! Len, based on this list, it looks like there’s no Swarovski cup ornament for 2017? as of date, there is no word of one. Since there is no online store, this is more difficult to source verification of. Talked with a store manager who has a box of Swarovski that they cant open for another week. They believe it is last year’s ornament but they aren’t sure. Talked with another who believes they will be releasing a premium card (the $200 ones) that is not Swarovski. With the lack of mugs, cards, etc.. It would seem that SBUX no longer has a deal with Swarovski. Just a guess though. Side note… Cant find a mini Las Vegas YAH ornament anywhere in town. What happened to the online store? Thanks for this list though, I just finally saw a few of these at target today! They announced it’s closure this past September. It operated horribly so it makes sense, but yes makes getting the ornaments more tricky. They did imply it would return as the website the day of closing said, “Goodbye for now”. But that won’t help us now. Is there an Arkansas ornament this year? If so, where can it be purchased? yes, as the master list shows, every state got one. As for locations, they should be at every location as supplies last. Can you tell me what year Massachusetts ornament was released? There is more than one Mass ornament. But the one referenced in this post is 2017. You can filter your search on my online catalog by name to see the other ornaments and their years. Hi I am looking for the mini cup with polar bears on it. I believe you can find them on eBay still.